I received a copy of this book from the publisher. It does not impact my review. 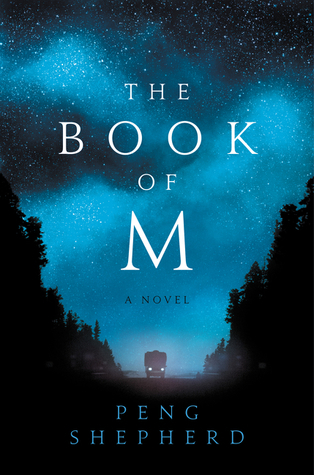 The Book of M will be available June 5, 2018. The Book of M is certainly an ambitious debut. Covering multiple characters, countries, and time in painstaking detail, it explores a new dystopian world where the loss of memories results in dangerous magic. While I did like the book, I wanted to like it more than I actually did. The pace is pretty slow as the world building is established and it took me awhile to really get into the story. The writing was very detailed and I personally would have appreciated a little less. I thought it made the book much longer than it needed to be. However, it was pretty character-driven and I did feel like I got to know the main characters pretty well. The story is told in the POV of Ory, Max, Naz, and The One Who Gathers. Ory and Max are married and when Max loses her shadow she decides to leave Ory so she won’t accidentally hurt him. She comes across a group of other Shadowless heading to New Orleans and joins them. Ory is desperate to find her and along the way comes across a group of other Shadowed, including Naz, a former Olympic hopeful in archery who now helps lead the soldiers of her group. Both groups are trying to find out if the rumors they’ve heard about New Orleans are true. The One Who Gathers was once just a man with retrograde amnesia who became connected with the first man to lose his shadow and his memories, but has become something incredibly different. I did think all the POVs were well done. I liked all of the characters, but I never really fell in love with any of them, which made it kind of difficult to really care about what happened to them. Overall, I enjoyed The Book of M, but I didn’t love it. I liked the characters and how they all became connected. However, I thought the plot was a little drawn out and felt the emotional impact I was supposed to experience missed the mark a bit. While this dystopian tale may not be for me, I think there will be a lot of people that will really like it. I recommend it if you enjoy character-driven novels with a touch of magical realism. I do look forward to seeing what Peng Shepherd writes next. This is the first review I’ve read on this one. I’ve seen it around a bit though. Does sound like an interesting premise. It is an interesting idea, but it wasn’t executed quite as well as I hoped it would be. Plus, I find I really have to be in the mood for this kind of genre to enjoy it. Interesting premise. Definitely not my thing, but it sounds like it was a decent read. Sorry it wasn’t a 5 star for you. Yeah, if you’re not that interested in this type of genre then it definitely would not be for you. Very pretty cover, though, isn’t it? It does sound interesting, but I don’t enjoy slow build ups, so perhaps it’s not the book for me! Maybe if you’re in the mood for something a little different and very character driven. Thank you! I definitely will hit that pause button haha.